As the world becomes more and more interconnected, the value of international understanding is increasing. Employers throughout the world recognize the benefits of a global business skills set. In today’s world, globalization and global citizenship education become relevant and the programs on this topic vary from global brand management to international economics. 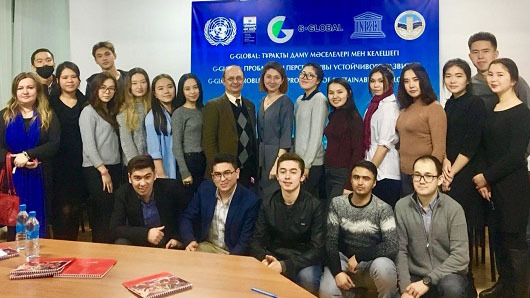 As a part of achieving the Sustainable Development Goal 4, UNESCO Almaty partnered with Al-Farabi Kazakh National University (KazNU) to design a course on “Globalization and Global Citizenship”. The course was an experimental international project. The course manager and instructor invited scholars from various universities, practitioners from United Nations agencies and international NGOs. The curriculum explored global citizenship not only by teaching about the latest intellectual discourses on globalization and global citizenship, but also by working on a series of practical case studies and course projects focusing on the local content. 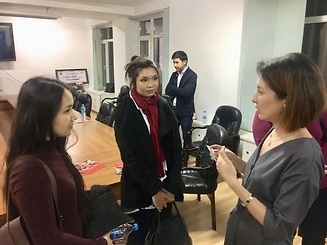 It provided students an opportunity to study cross-cultural management techniques, international marketing, opinion of foreign customers, region-specific issues related to implementation of SDGs, and social aspects of development of eco-tourism in the region. The course assessed current trends in globalization in general and in particular, changed the understanding of the concept of the global citizenship. The classes focused on developing and strengthening students’ knowledge on the work of international organizations in promoting global citizenship. It also included such areas as the cultural, economic and social dimensions of globalization as well as the emergence of information and communication technologies and their impact on societies. The tutorials also taught participants about applying different international sources (such as UN and UNESCO documentation) in practice. This includes analyzing cultural, economic and social reports on globalization and thinking critically about new social media materials. Interactive-seminars and analysis of case studies complemented the course. Students divided into several teams that dealt with theoretical and practical issues in their research assignments. to develop practical skills in writing research articles and papers. During 2018 spring semester from 14 March to 16 May, 14 students were the first ones to discover and complete the course on «Globalization and Global Citizenship» at KazNU. During the fall semester 2018, KazNU plans to fully integrate this online course into the educational program at university as inter-faculty project and to offer it free of charge to all students at KazNU and partner universities in the region.